The air that Saturday morning was chilly and a light drizzle fell from the sky, the typical weather pattern for a November day in Seattle. This time it wasn’t the typical Seattle routine. We were meeting up with Bong and Darlene and following along as they took RWB “Yujiro” on a short road trip around the Olympic Peninsula to our weekend destination – Sequim, WA. Within a few hours we would be reunited with other members of the RWB family as they were gathering in celebration of Nakai-san’s return to Seattle. A few days prior to this trip we were back at Wild About Cars Garage where Bong wanted to change up Yujiro’s appearance for the upcoming RWB reunion. He swapped out the attention-grabbing Champion Wing Nakai-san installed a little over a month before with a second wing option Bong purchased and had on standby, the RWB Ducktail. Seattle’s 4th RWB was being introduced to us on a beautiful piece of waterfront property known as Dungeness Bay Manor. It’s 7-acre lot features an eccentric home with an amazing view of Dungeness Bay and the country’s largest natural sand spit (at 5.5 miles/8.9km), the Dungeness Spit. Beyond that and across the Strait of Juan de Fuca, British Columbia. The property’s owner greeted guests of the build with his own collection of amazing cars that included a few Porsche 356s. This time it was fine furniture builder Brian Kawal’s and friend Marc Lassen’s turn to have their 964 Porsche 911 Targa transformed by the hands and keen eyes of the legendary Porsche widebody master. You can spot one of Brian’s own masterpieces behind the 911, Nakai-san’s resting place during the build. The Rauh Welt Begriff welcoming committee included (from left to right) RWB “Spectre” from Portland, RWB “Yujiro”, and RWB “Meguri-Ai” of Seattle, plus a couple more 993s that will one day receive the RWB treatment. An adjacent shop on the property is where we would all watch Nakai-san do his thing. “RWB” etched on The Retrofit Source HID projector lens, a nice touch! The wide set of fifteen52 forged 3-piece Formula LTW wheels that were getting RWB fenders shaped around them. 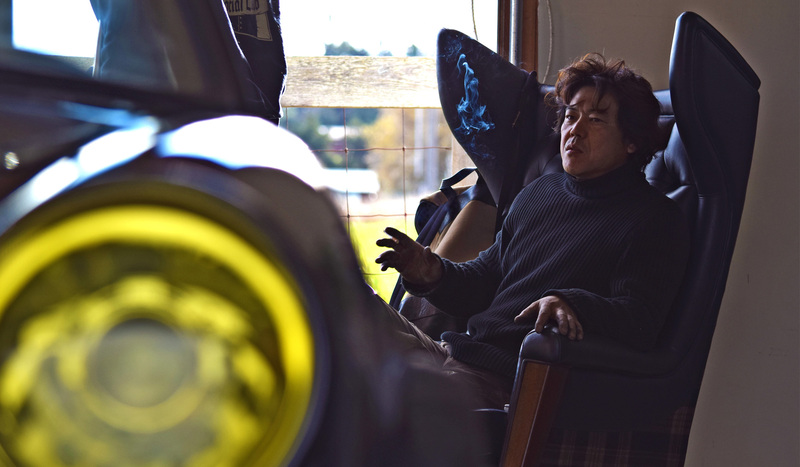 With each opportunity we get to watch Nakai-san work we are continually amazed at his focus and attention to detail despite having strangers constantly in his work space. These builds attract all walks of life. The weather held up and we were spared any precipitation but being right on the coast made for a crisp, cold Sunday afternoon. Fortunately we had the big house to retreat to when needed and that gave us the opportunity to sit and chat more with members of the RWB family while we were thawing out. We’ve seen strong bonds and friendships formed from all types of automotive related gatherings we’ve attended throughout our life together and these “RWB builds” are no different in that a common theme or passion brings people together that would otherwise not relate or interact with one another. Differences are set aside and people are united. This crew maintains a positive attitude and shares a mutual respect for one another and their guests, an inspiring group of people. The RWB family continues to be amazingly hospitable to us and we are forever grateful for their friendship.